The UNESCO-listed Simien Mountains and the UNESCO-listed city of Gonder (or Gondar!) 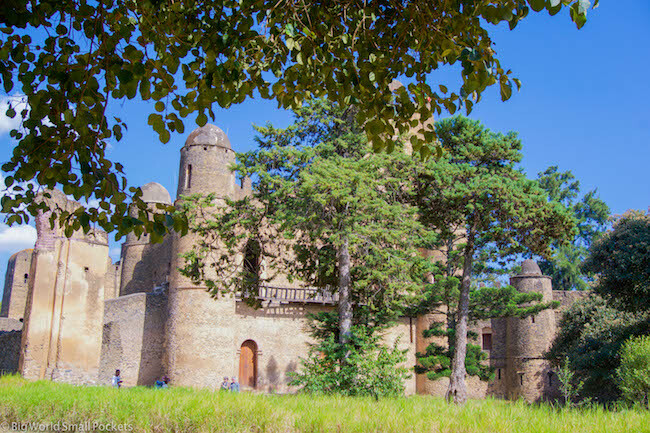 are – perhaps unsurprisingly given their world heritage status – among 2 of Ethiopia’s finest attractions. Situated close by each other, many tourists explore them together, as I did, and that’s exactly why I’m pairing them together in this guide. Located in the Amhara region in Northern Ethiopia, I visited these 2 great parts of the country during my first trip here in December 2017 and certainly they were a large part of why I fell in love with this magical land. 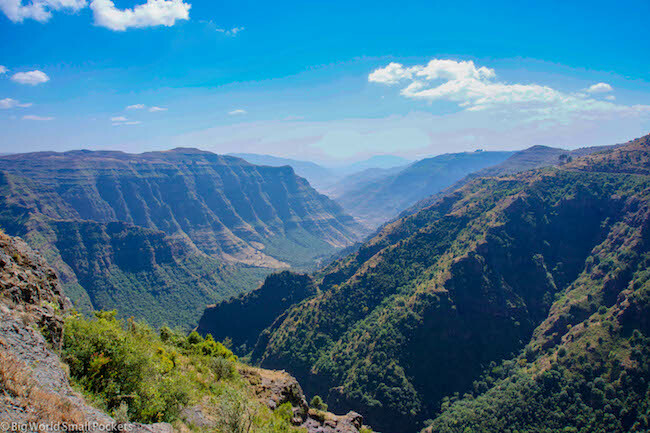 From the soaring vistas of the Simien to the crumbling castles of Gonder these 2 destinations are wildly different, but equally as magnificent. Indeed, many travellers I met in Ethiopia claim the Simien Mountains, in particular, as one of their Ethiopia highlights and if you’re heading to this country, then please do not miss this national park, or Gonder, either. 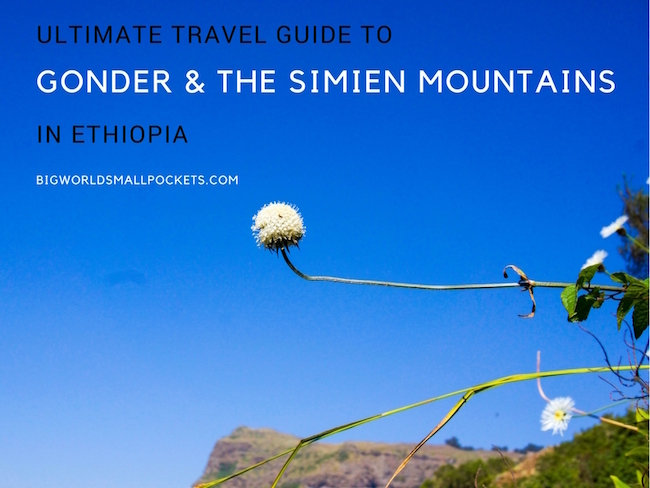 And with my ultimate travel guide to Gonder and the Simien Mountains, you can get the full rundown ahead of your trip so that you have the best time there too. This page contains affiliate links meaning Big World Small Pockets may receive a small commission on any purchases at no extra cost to you. Prices correct at the time of publication. This small city is often referred to as the Camelot of Africa due to the amazing collection of crumbling castles, fortifications and palaces it houses, primarily in its Royal Enclosure. These date originally from the 1600’s when Gonder was the capital of a large and powerful empire trading gold and ivory from the south via the Red Sea, Sudanese and Egyptian civilisations. For this alone, Gonder is worth a visit, but this lively, student city has its own charm beyond this, that I fell in love with. It feels like a real working city, a bustling little place that boasts some of the best food I had in Ethiopia! 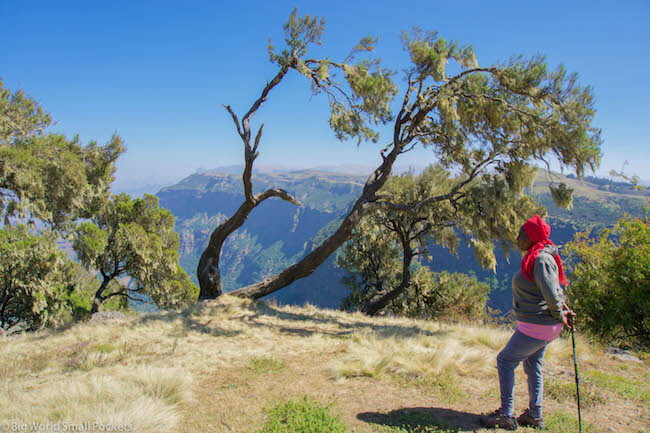 The first national park in Ethiopia, the Simien Mountains still offer some of the most spectacular hiking here and are well worth a visit if you feel like stretching your legs out in nature for a day… or 8! LOOKING FOR A BUDGET TOUR IN ETHIOPIA? If you’re interested in an unforgettable, well-priced tour in Ethiopia with guides you can trust, then email me at steph@bigworldsmallpockets.com with details of where you want to go and I’ll send you my top recommendations – simple! Like most of Northern Ethiopia, Gonder and the Simien Mountains are best visited during the dry season, which runs largely from November to April. 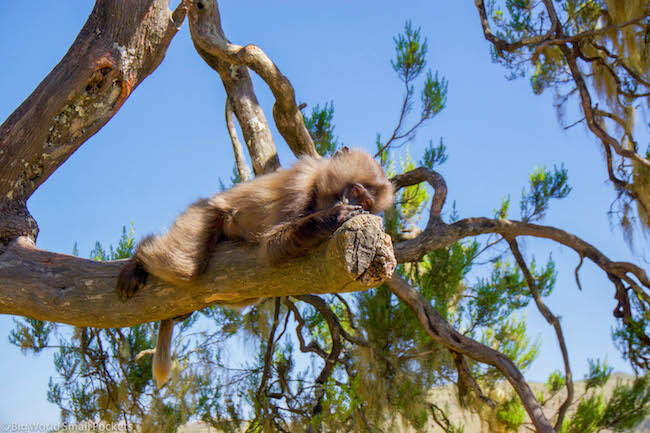 Because the land here is high above sea level, temperatures, especially in the Simien can be cool at the best of times and not having the sun to warm you up would not make this place half as much fun. 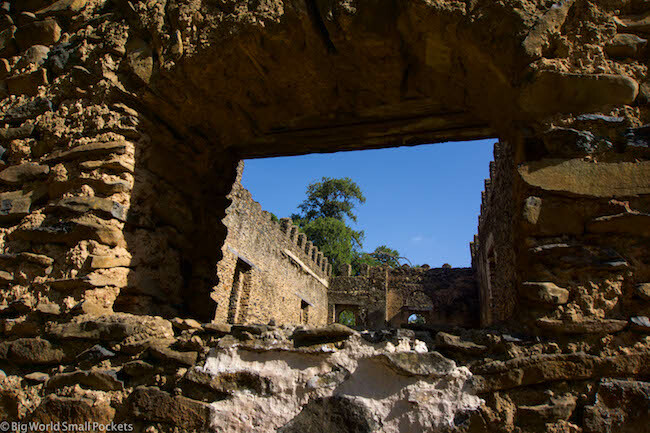 Ditto, you want that blue sky for your epic historical Gonder shots, so I’d really advise avoiding the rainy season here when everything will be cold, damp and likely, very muddy! So as I’ve said, this part of Ethiopia is high and mountainous. 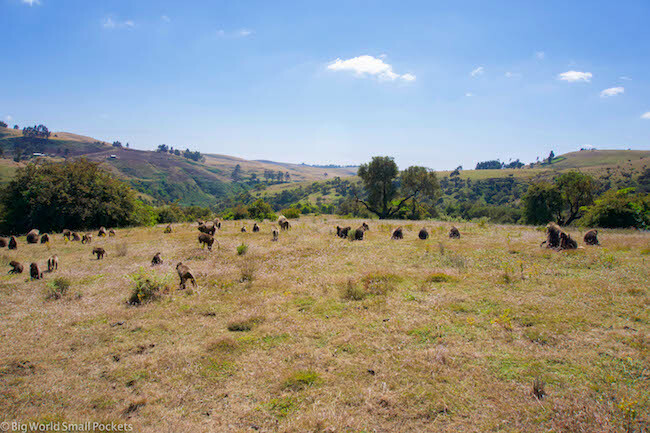 In fact, to be precise, Gonder sits at an elevation of 2300m, above sea level and the Simien Mountains National Park at an even higher altitude of over 3000m above sea level. What this means is that hiking in the Simiens is always quite cool, even in the day time and I’d certainly advise trousers and a long-sleeved top even if it is a blue sky day. Night time temperatures in the Simien plummet and you want to be well-prepared with warm clothing if you’re planning on camping overnight here. Being slightly lower, Gonder is really warm during the day, but can get chilly at night, so do bring trousers and a good sweater. That said, both destinations generally present clear, blue, cloudless skies during the dry season and waking up and warming up each morning to a glorious bout of sunshine is delightful! Get Your FREE Checklist Now! Just enter your details below and I'll email it you - simple! You can fly to Gonder from Ethiopia’s capital Addis Ababa with Ethiopian Airlines. The journey, if direct, is no more than an hour. You can also fly to Gonder from the city of Axum. REMEMBER! You can get really cheap domestic flights in Ethiopia if you fly internationally with Ethiopian Airlines. 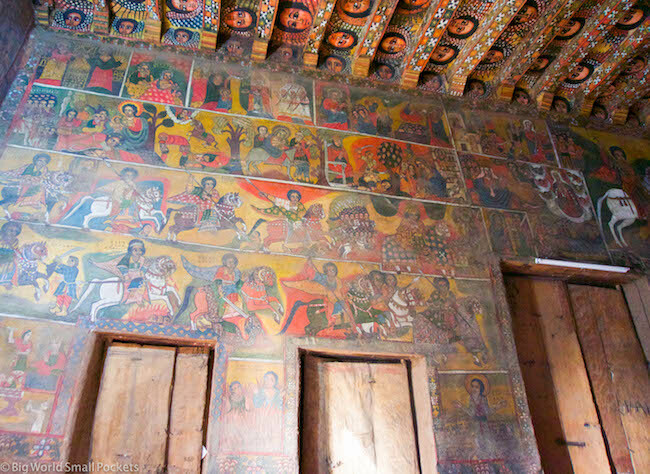 For more great tips on visiting this county, check out my post EVERYTHING you need to know about travel in Ethiopia. Alternatively, you can take a 3 hour minibus ride from the city of Bahar Dar or a long (possibly 2 day bus journey) from Axum as well. Coming by bus from Axum you’ll likely have to change vehicles and /or spend the night in the town of Shire. Coming from Bahar Dar the minibus route is direct. Most people base themselves in Gonder and then head to the Simien Mountains National Park from there. It’s about a 2.5 hour ride from Gonder to the park entrance. Many tours for the Simien Mountains can be easily arranged and started in Gonder as a result of this. 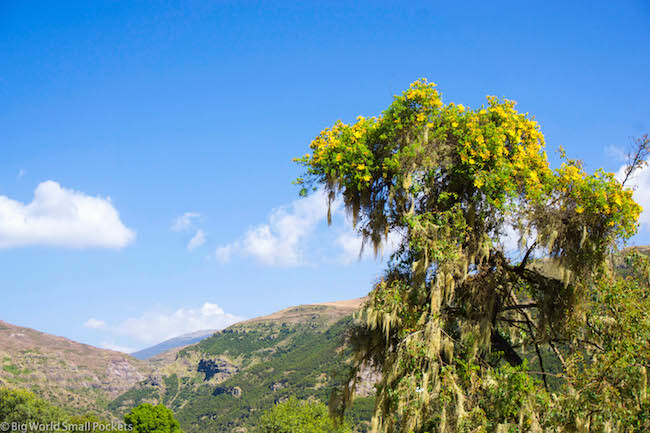 The other alternative is to start your Simien Mountains tour from the closer town of Debark, which sits at the foot of the park. Debark is much smaller, with less tourist infrastructure, but there are a few guesthouses, restaurants and tour companies you can find here. One advantage of getting to the Simien Mountains from Debark is that it might be cheaper (because you cut out the Gonder – Simien drive). The other advantage of starting your Simien time in Debark is that it’s closer to Axum (slightly). So, if you are coming from there or Shire on a bus, you’ll pass Debark on your way to Gonder and may just want to get out and stay here, rather than doubling-back on yourself. That said, most tourists head out to the Simien Mountains from Gonder, likely because it’s easier to be in city and they’re visiting it anyway. For Gonder, I recommend staying at least 2 nights – this will give you time to relax here, as well as see all the cultural and historical attractions. Trips to the Simien Mountains start from 1 day long – in which case you’ll need to return to Gondar at the end so schedule in another night – and run all the way up to 8 days long. 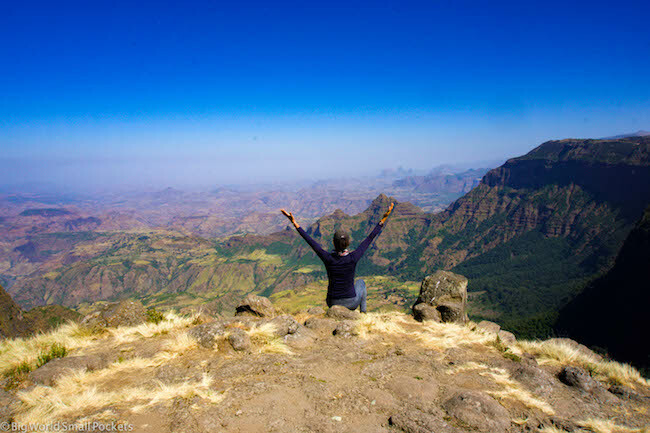 How much time you have, how much money you have, how much you want to hike and how much you like camping will all influence how long you want to stay in the Simien Mountains. 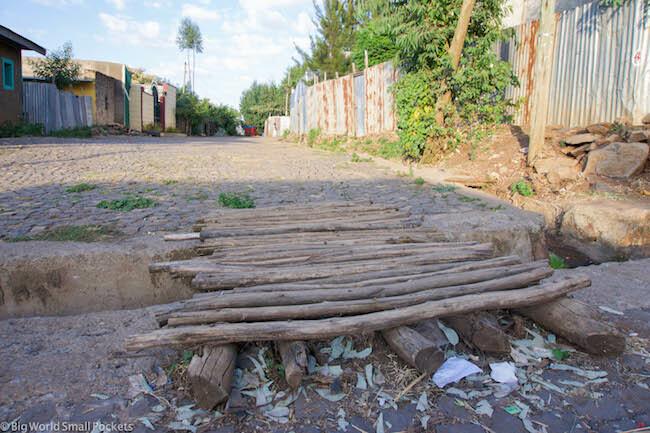 Personally, I was in a bit of a rush by the time I got to Gonder and simply opted for a day trip to the Simien Mountains from the city, returning there in the evening. Even if you’re only going for the day to the Simien Mountains, you’ll need to pack camera, sunscreen, hat, water and lunch. Arrive and acquaint yourself with the city, its Royal Plaza, its cafes and its great eateries. Eat lunch at the Four Sisters Restaurant and then a grab coffee and /or an avocado & lime juice from the Gonder Central Hotel and enjoy the people watching. At sunset, head up to the Goha Hotel for the best views in town! 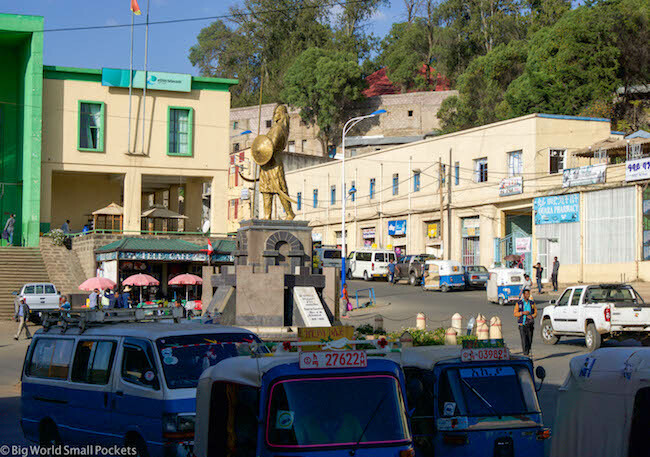 Start your second day in Gonder at the Royal Enclosure – home to the main historical attractions in the city. Spend a good few hours here taking in all the ruins and tales of former glory. After this head to Fasiladas’ Bath (included in the same ticket) before finishing your day at the church of Debre Berhan Selassie, one of Ethiopia’s quaintest churches. 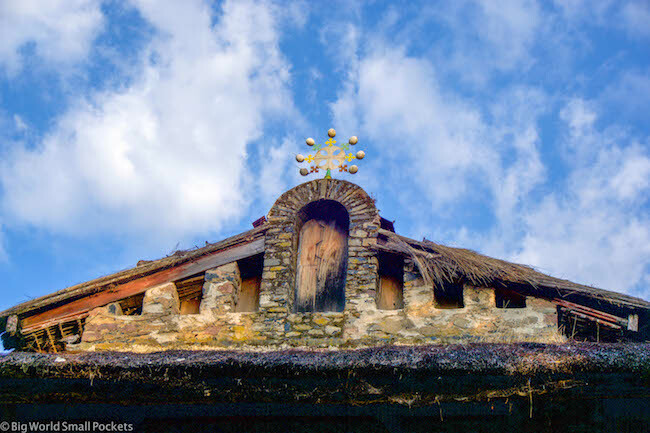 This beautiful little church has mud walls and some amazing artwork inside. It’s small, but very atmospheric. In the late afternoon light you’ll enjoy stunning views bathed in a golden light as you walk up the hill to the church and watch many friendly locals who pour out onto the streets to meet friends or play football. It depends how much hiking you want to do, but as discussed, Simien Mountain trips can be arranged for anything between 1-8 days. If you’re doing longer than a day trip, you’ll camp in the park and / or stay in community lodges. You need to take all your food, cooking equipment etc, so check that the tour company you’re using provide this as well as tents. 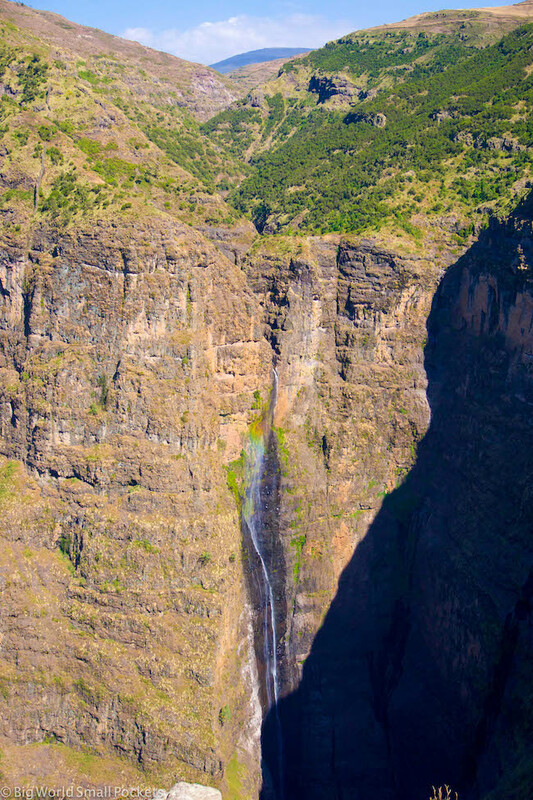 I only took a day trip to the Simien due to running out of time, but I really think a 3 day, 2 night tour of this national park would give you the best opportunity to discover its amazing landscape without blowing your budget. #1 Headlamp – Required for those all too often power cuts. I always go for Black Diamond, which hasn’t failed me in Africa yet! #2 Toilet Paper – Most places don’t provide it! 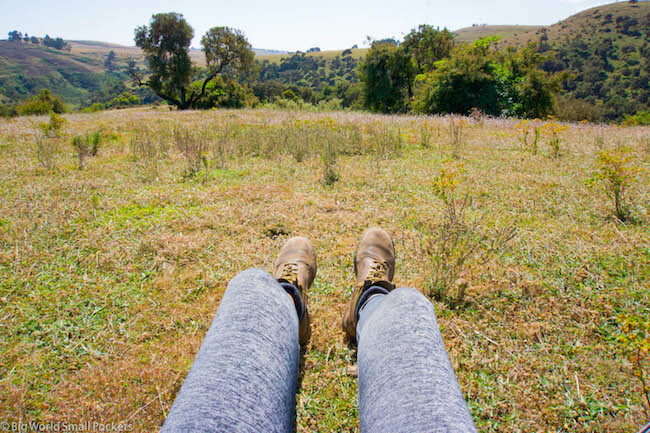 #3 Long, Thin, Hiking Trousers – Perfect for the cold evenings in Gonder and hiking in the Simien, Columbia do a great range for women. #4 Good Camera – An absolute must if you’re looking to capture the incredible landscape and historical artifacts of both these destinations. I love my mirrorless Sony A6000, which is light, compact and robust – ideal for Africa travel! #5 Travel Scarf or Sarong – Whether it’s covering your shoulders in the churches, wrapping around you at night as a shawl or using as a protection from the dust, a travel scarf or shawl is a great multi-purpose item for Gonder and Simien. 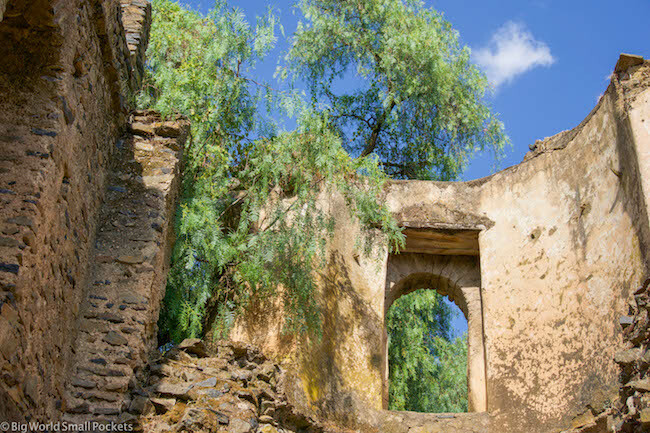 For sightseeing in Gonder there are 2 main costs, that of the Royal Enclosure, which includes entrance to the Baths (200 Birr), and that of the entrance fee to the church of Debre Berhan Selassie (100 Birr). For Simien prices, I ask the question, how long is a piece of string?! Generally for a day trip the price is around $80 USD, but if lucky, you might get it down to around $65 USD, which is slightly more palatable! It’s worth noting that often people who try to hike in the Simien independently cannot do it for less money than with a tour, given the guide, scout, entrance, transport, food and accommodation costs. 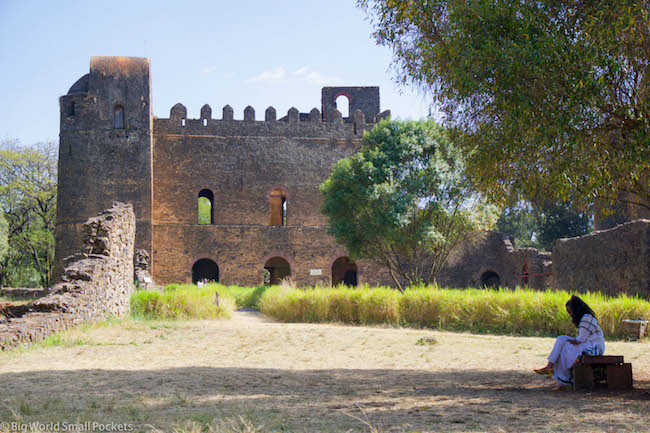 In Gonder, it is possible to take a guide who will explain the importance of the historical sites within the Royal Enclosure to you. 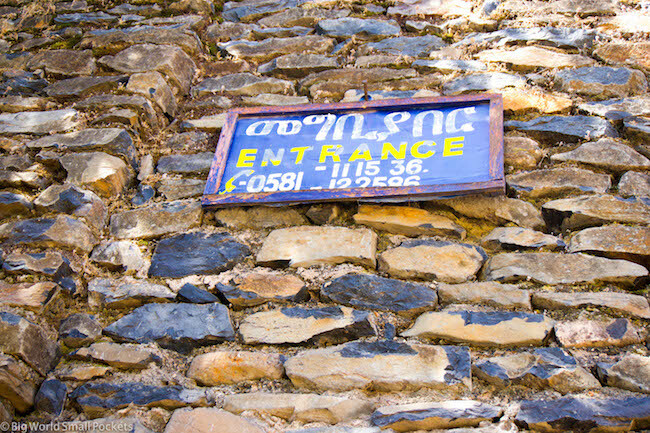 Like most Ethiopian tourist-friendly cities, such as Axum and Lalibela, there is a guide cooperative office located at the entrance to the main attraction. These offices work on a rotational basis, so there will always be a guide (essentially the next in line) ready to take you around. Prices start from 200 Birr. I didn’t take a guide in Gonder, simply because I’d used them everywhere else and was trying to claw back my budget a bit! However I now regret it as the significance of what you’re looking at can really be lost without the historical context and info given by qualified guides. 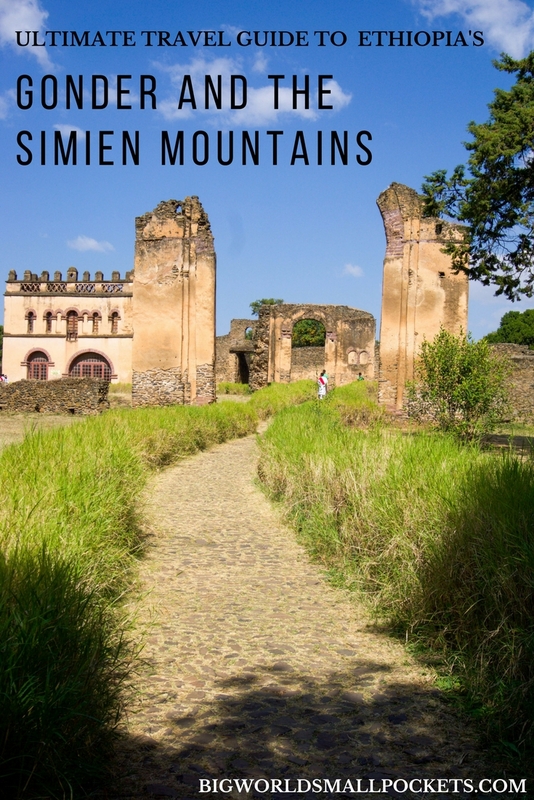 Quite simply you have to have a guide for any hiking you do in the Simien Mountains, even a simple day trip requires one and you’ll not be allowed in without! That is one of the reasons trips here are so expensive; because as well as a guide, you also have to have an armed scout. To be honest, it’s easier and, more than likely, cheaper to just use a tour company. They sort everything for you and have good connections meaning they can source better deals than you’re likely to be able to access as a foreigner. For budget accommodation in Gonder, I recommend Yohannes Guesthouse. It’s a short walk out of town, but boasts a camping space, as well as private rooms with shared bathroom and a communal kitchen. 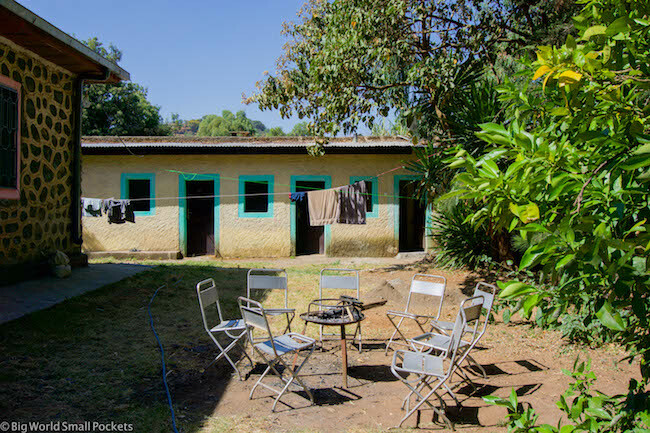 It’s not the biggest bargain around (400 birr a night) – I’ve had ensuite rooms with balconies and included breakfasts for less in Ethiopia, but it is a friendly place with free wifi, plenty of outside space and a good spot to meet other travellers. Alternatively, in town, L-Shape Hotel (350 Birr a night) gets good reviews with private bathrooms and hot water! The Florida International Hotel (1000 Birr a night) is also good if you have a slightly larger budget. For breakfast head to the Tele Café, which is underneath the central Post Office. Their special ful is great, so is the coffee and, situated on the main square, the people-watching opps are tremendous. For lunch, Rain Restaurant does good local and international fare for reasonable prices. In the evening it’s all about the Four Sisters – a tourist trap, as in there’s very few local here – but the food is delicious and very well-priced. These guys also offer cooking classes if you want to learn how to make injera for example as well as nightly music and dancing… Ethiopia style! As a major city, Gonder has “everything” you should need. 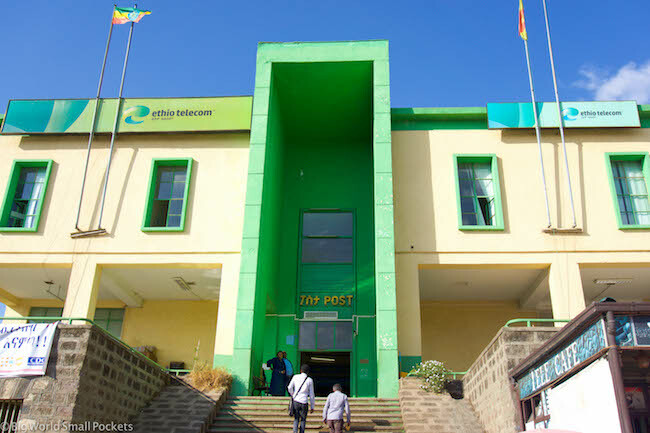 There’s plenty of shops, pharmacies and banks if required, as well as a massive post office, Ethio Telecom office and Ethiopian Airline office. Most things are clustered around the Royal Plaza. Most hotels / guest houses provide laundry services. There’s a fantastic project – Yenege Tesfa – run in Gonder to help street children in the city. You can assist by purchasing meal tickets at most of the larger hotels here and distributing as you see fit. 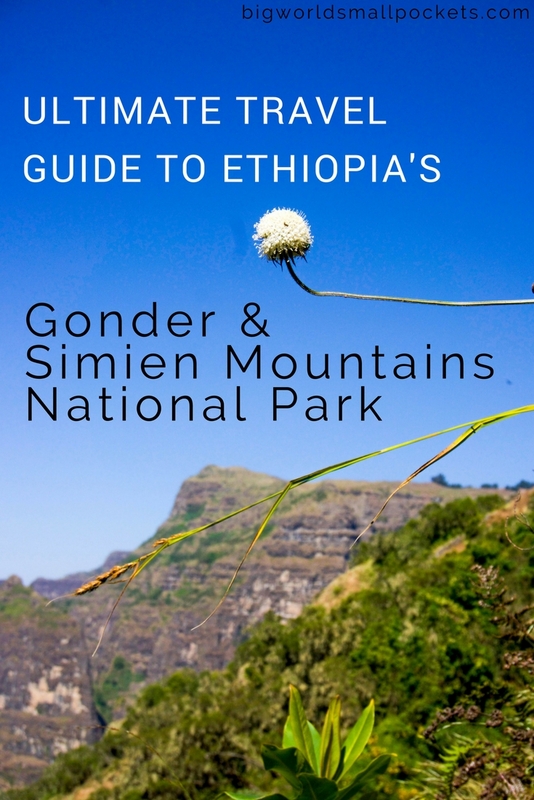 So there you have it, my ultimate travel guide to Gonder and the Simien Mountains National Park. Have you been to this stellar spot? Did you love it too? About the Author: Creator of Big World Small Pockets, Stephanie Parker is a budget travel addict! Originally from Jersey in the Channel Islands, Stephanie backpacks the world collecting tips, advice and stories, to share with a smile More from this author. 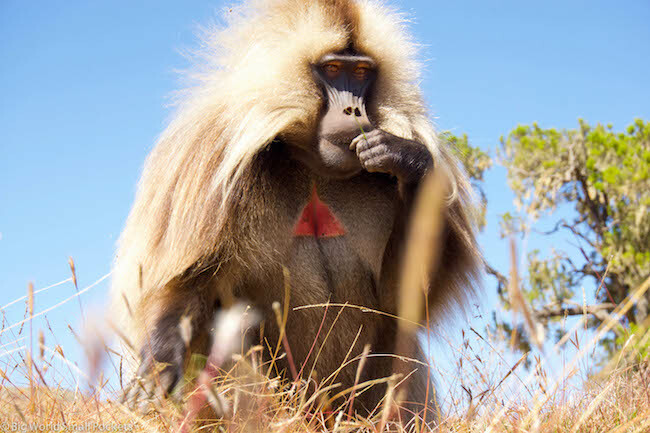 Last winter, a guide was not necessary to trek in the Simien Mountains – just a ranger – he may also show the way. Walking without a guide lowers the costs significantly. Strangely, the most expensive part of trekking in the Simiens without a tour was getting a ride from the Chennek Camp back to Debark: From what I´ve heard, there is some kind of mafia controlling it. And the buses passing by were too full. But I´ve thought it might be a good idea to take a bus from Debark to Chennek and then walk down. I have recently (10 days ago) returned from Ethiopia where one of my most memorable trips was a drive from Gondar to Kosoye, (stop at big blue sign on left hand side of the road that says “Welcome to Natural Scenic Beauty of Wunania). This is way before you reach Debark. A young lady English speaking guide appeared named Turingo who was excellent. It was a one hour hike to area to see the baboons at close range and reach a stunning viewpoint, followed by a coffee ceremony at a nearby little lodge. Unbelievably beautiful scenery and an unforgetable experience. You won’t regret it. 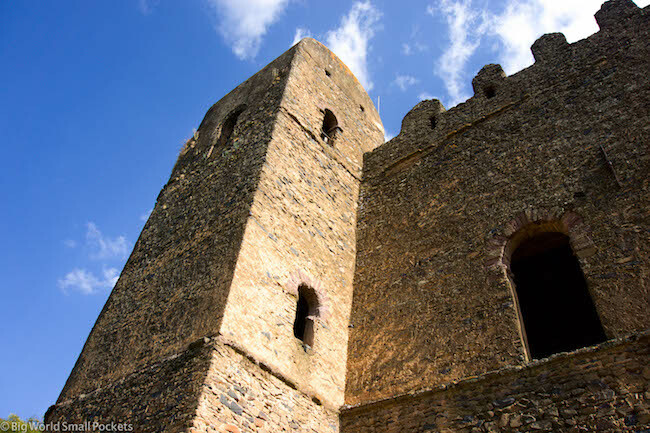 Ask in Gondar about arranging a local guide; you will need one ( very moderate expense). I did not have a similar experience at Tele Cafe. I thought their macchiato was terrible; weak and milky. And they charged us an extra 4ETB each, claiming the menu was old and prices incorrect. They would not honour their advertised price and had the gall to snicker to each other as we paid and angrily left. A matter of cents, yes, but we felt very poorly treated there and wouldn’t recommend them at all.